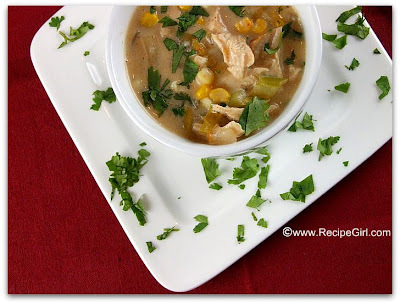 We cooked up some turkey a little early this year and came up with a wonderful soup for the leftover turkey meat: Creamy Mexican Turkey Soup. It starts with a simple saute of carrots, celery, onion & garlic. The veggies are then simmered with chicken (or turkey) broth. The addition of milk, flour and spices make the soup slightly creamy. Mild canned chiles are added too. It’s not a *heavy* creamy soup- not made with whipping cream. It’s not spicy either. You could certainly make it heavy creamy (add whipping cream) or hot and spicy (add chipotles in adobo). 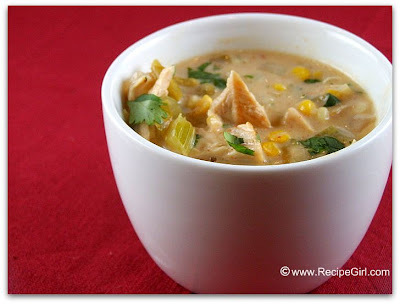 Corn, turkey, and cilantro are incorporated toward the end of simmering. Just before serving, a cup of Monterey Jack cheese is whisked in until melted. The cheese is what helps make this soup more on the creamy side. Don’t you dare leave it out. We liked this soup the way it was- we’re not spicy kind of people. In fact, we loved this soup. Even the child in our house gobbled up every bite. It was very easy to do, and it will be a definite repeater. 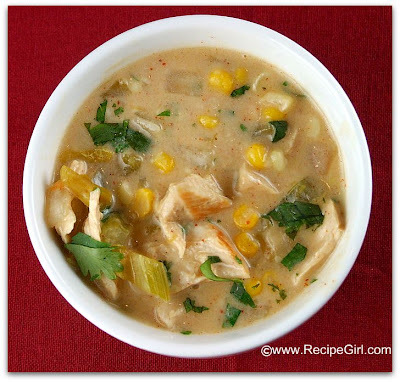 Great recipe for using that leftover turkey! If you’re celebrating Thanksgiving today, have a happy one! YUMMY!!!!!!!!!!!!! This was a huge hit! Thank you so much for the recipe, I will make it often!